I am planning on developing two new-to-me cupcakes, Thai ice tea and horchata. 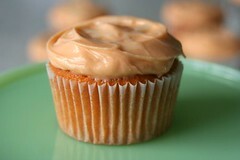 With the Thai ice tea cupcake, I really want the flavor of the thai ice tea as well as sweetened condensed milk. I tried out a Thai ice tea cupcake recipe this past weekend. The cake: The cake came out pretty good, it was tasty and had a nice crumb, but the Thai ice tea flavor was much too subtle. For the next experiment, I plan to brew tea instead of use instant thai ice tea, maybe that will get me the flavor I want. Otherwise, I am happy with the result. I planned to bring this experiment to the craftactory the next day, so I wanted to end up with something edible if not completely successful. So, I decided to make a cream cheese frosting with a hint of thai ice tea. The result of the experiment became: Thai ice tea cupcake with Thai ice tea cream cheese frosting and a drizzle of sweetened condensed milk. The cream cheese overpowered any flavor of thai ice tea, but was yummy. The cupcakes were a hit at craft day, so that’s good… Recipe #0001 follows. Note: I had a good amount of frosting left over (about 1/3 of the volume). I am usually ok with that, as I freeze the left overs and use them later on. Never hurts to have cream cheese frosting at the ready. *Anxiously awaiting* the horchata cupcake recipe! This one sounds good too!! You might want to try bottled Thai iced tea instead of brewing your own or the instant. I find those don’t really taste like the real Thai iced tea and the bottled kind generally does. You can find it at (duh) Thai grocery stores or some Asian food stores. It’s good stuff. Most Thai restaurants use the bottled stuff. Thanks for the tip. I was in a Thai grocery, but no sign of the bottled stuff. I will check around at some others. hmmm… any change this could be slightly modified to taste like the thai iced coffee instead of tea? my guy loves that stuff. I have a recipe for Earl Gray Tea wafers which uses both brewed tea and tea leaves ground with the sugar for flavor. I’ve never tried the recipe, though I’ve been tempted. Perhaps a similar method of flavoring your cupcakes would work. I also use espresso powder (Medaglia D’Oro) in baking. Perhaps the powder for the instant Thai tea would also work as a flavoring ingredient, just added to the dry ingredients, or reconstituted with a small amount of water, or whatever liquid the recipe calls for. How about that Davinci Spiced Chai syrup concentrate? You might be able to get some great flavor without adding a ton of moisture. You could probably use it as a substitute for vanilla extract? I got Thai Ice Tea ice cream at Mitchell’s this past weekend… It was good, but not so thai-ice-tea-y. I thought to ask them their secret, but think against it. I am going to try to find the bottled stuff (I hope its unsweetened as I need to control the sweetness) and try brewing it and crushing the leaves. About thai ice coffee — the coffee flavor would be relatively easy as good espresso powder products exist, but I still need to figure out the sweetened condensed mill frosting that would sit atop said cupcake. Haven’t tried earl grey, chai, or green tea cupcakes… maybe some day. thanks for the inspiration! I tried your recipe and doubled the tea mix in the cake and I made a frosting with 4 packets of tea mix. You could definitely taste the Thai iced tea flavor, but it still was not reeeeally potent. I also made a white frosting/topping that I layered on top of the orange one that had a pretty strong flavor of condensed milk. That made it look like the real drink, too. Thai ice tea has palm sugar syrup in it. Palm sugar is dark brown, tastes like caramel and molasses, and is available at most Asian grocery stores. Perhaps you could include palm sugar as part of your ingredients next time round? Ah! Of course, I have palm sugar in my pantry. I use it for curries. Duh. I need to work on this recipe again soon. I was looking for cupcake recipes for my daughters 4th bday and came across your blog. You do some amazing stuff!! I wanted to try out the cream cheese frosting in the Thai iced tea cupcake but with out the Thai iced tea flavor. Do I just leave that ingredient out?? The cupcakes as they are with the cream cheese frosting are delicious! I made them recently for a party and everyone loved them!!! Tasty, but I’ve been wanting to try the recipe with the bottled stuff. I found some authentic bottled Thai tea at the Japanese shop “Genki” in SF. How would you suggest incorporating it into the cupcake and frosting recipes?